6 Deck Blackjack is the classic Playtech's version of the card game that uses 6 regular decks of 52 cards and follows the "Las Vegas Strip" Blackjack rules with some exceptions (see below). The object of the game is for the your cards' total to be closer to 21 than the dealer's cards, without exceeding 21. All card values are the standard: Aces count as either 1 or 11, face cards as 10, and number cards as their face value. The rules are basically the same as in the standard "Las Vegas Strip" rules, with the following exceptions: The deck is shuffled after completion of each hand. The player may only split once and only one card is drawn to split Aces. The player may double after splitting. The dealer will check (peek) for Blackjack if he is showing an Ace or a 10-value card. (1) Dealer has Ace up card, player doubles and/or splits: entire player's bet lost. (2) Dealer has 10 up, player splits: entire bet lost. (3) Dealer has 10 up, player doubles: only original bet lost. (4) Dealer has 10 up, player splits and doubles: additional bets from splitting lost but doubling bet(s) returned. This is definitely a mixture of Vegas and European game rules. This is an American hole card game, e.g. the dealer peeks for "natural" Blackjack. If the dealer's up card is an Ace or a 10-card, he will peek at his cards to check for Blackjack before the player makes any moves. If the dealer does have Blackjack and the player doesn't, the dealer will win the game round. It's theoretically possible for you to draw 10 cards without going bust. In this case your hand automatically wins, except when the dealer has Blackjack. If your first two cards have the same value, you may split them into 2 separate hands by placing a second bet equal to the original bet. You'll then draw additional cards to each hand. You may draw as many cards as you like on each split hand, but you'll receive only one card if you split 2 Aces. If you receive an Ace and a 10-value card in a split hand, it's not Blackjack, just a 21-value hand. If the dealer shows an Ace in his initial hand, you are given a chance to insure your bet against him having a Blackjack. If you get Insurance, an amount equal to half your original bet is placed separately on the table. If the dealer does have Blackjack, you are paid 2 : 1 on your insurance bet. This way you do not lose your original bet (you get the 2x half your original bet, plus the insurance bet). If the dealer does not have Blackjack, you lose your insurance bet. The optimal strategy card is shown as table with the Dealer's up card the first row and player's 2-card combination the second column. The letters tell you what to act (Hit, Stand, Double Down or Split) depending on the different combinations of dealer's and player's hands. 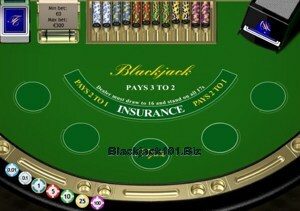 The 6 Deck Blackjack strategy tables for Playtech's rules are shown above for player's hard totals, soft totals, and pairs along with a legend. 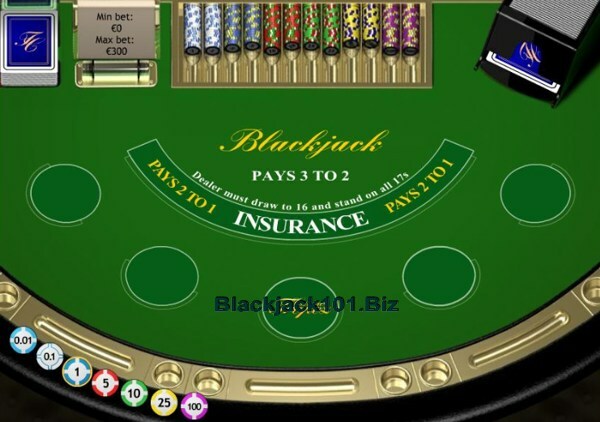 You can play the 6 Deck Blackjack game at Europa Casino - popular International online casino and one of the leader in Europe due to customer support in 12 languages and localized casino software. Europa offers you to play 10 different versions of Playtech blackjack games, like BJ switch, surrender, single deck, 21 Duel and pontoon. New players can receive up to €/£/$ 2,400 in welcome bonuses.